Today is good Friday. I’m off work and my kids are home from school. We’ve had a lazy morning and I’ve been slowly chipping away at my to-do list. My children are binging on television. I was going to go on run but couldn’t find my fleece. There’s still a little chill in the air, and by the time I found a sweatshirt, it started raining quite hard. I shrugged my shoulders and decided to sit back down on my couch. Now I’m here, writing this post, looking out my window. The tree on our front lawn has yielded angelic blossoms. I try to find words to describe the scene, but language and photographs fall short. I can hear jet noise of Navy fighters flying in the distance, the birds chirping, the rain still falling. As if overnight, spring is here. Spring always seems to creep up slowly, and once it arrives, I’m amazed we made it through winter. It’s like the arrival of spring allows me to reflect and take stock of what happened in the darkness. I’m going through a strange time in my faith, which feels more pronounced today, on Good Friday, knowing I won’t be attending a church service today or on Easter. What had been our church for five years has grown into a mega-church and the services feel overstimulating and so distant from the intimate space they once were. I wonder if worship can be as simple as sitting on a couch, daydreaming and looking out the window, wondering about God, and trying to put the complexity of human emotion and existence into the medium of language. After all, it’s my favorite thing to do! It’s what I keep coming back to, the place where I feel God’s presence most closely. Good Friday is a day of grief but also a day of feeling the discomfort of polarizing emotions. We dread the death and believe in the resurrection. We lose religion and gain faith. The air is warmer with still a slight chill. The tension makes us crazy but it’s also the energy that drives any good story forward. It’s the fabric of our humanity. It seems like this is what Jesus’s life is all about…entering our world…helping us to embrace it as well…leading us back to God in the midst of it. So, this weekend I’m taking stock. Not from a church pew, not in a fancy easter outfit, not by eating Cadbury eggs. 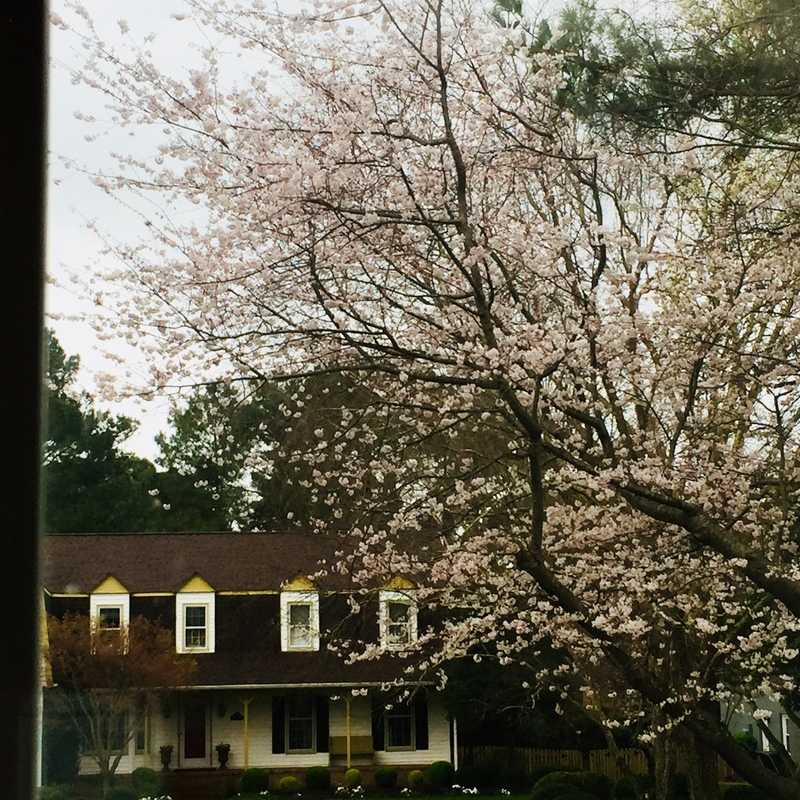 I have done and bought nothing to prepare for Easter, but I’m looking at this tree outside my window and I’m bearing witness to the realization that it didn’t do anything either, yet somehow, after a winter of bare and brittle limbs it has these indescribable blossoms that are blessing the sky before they blow away in the wind again. I’ll close with a poem I wrote about the month of March, a month of tension and in-between spaces. The poem first appeared in the Spring 2016 issue of Relief Journal.